The 2017 edition of the Kohler Grand Prix at Road America is now in the books. 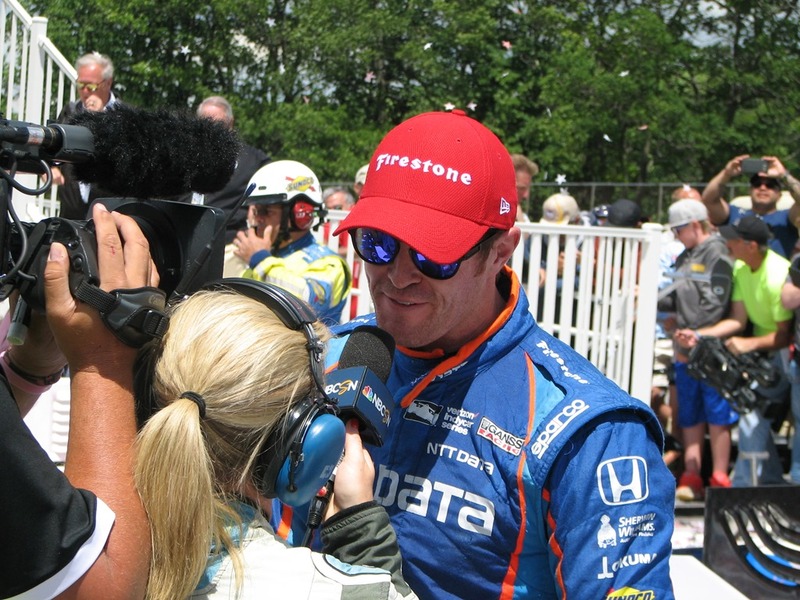 My disclaimer is this – if you watched the race on television, you know an awful lot more than I do. Susan and I were literally all over the track. We started out on the grid just before the command to start engines. From there, we headed to Turn One to watch the start of the race. After about three laps, we went to Turn Three and watched a couple of laps there. We then headed for the Carousel and watched about five laps. From there, we went to the inside of Turn Five and watched maybe three more laps before heading to the trail that runs alongside Canada Corner and Kettle Bottoms. We were going with the cars facing us, so we were going te opposite direction of the racing. That’s where we were when the Tony Kanaan crashed took place on Lap 46. 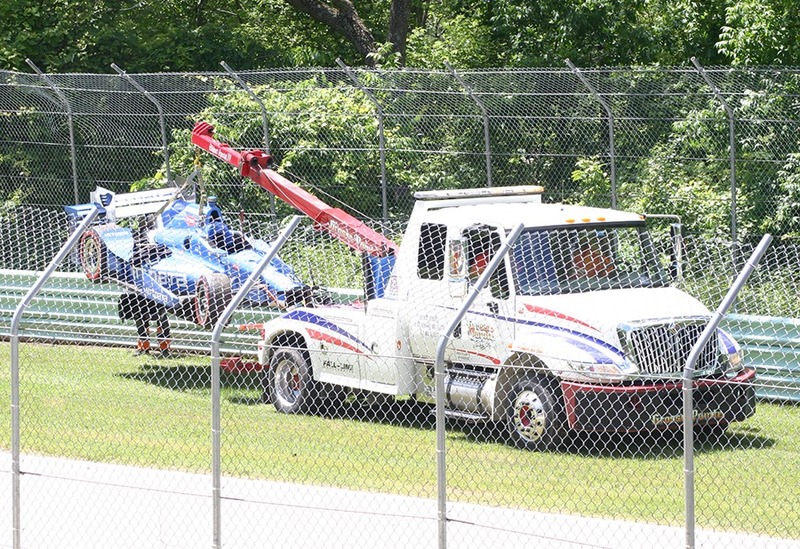 We didn’t see it happen but came upon it just as they were carrying Kanaan’s car away. From there, we went to Victory Lane and watched the final four laps on a video board. 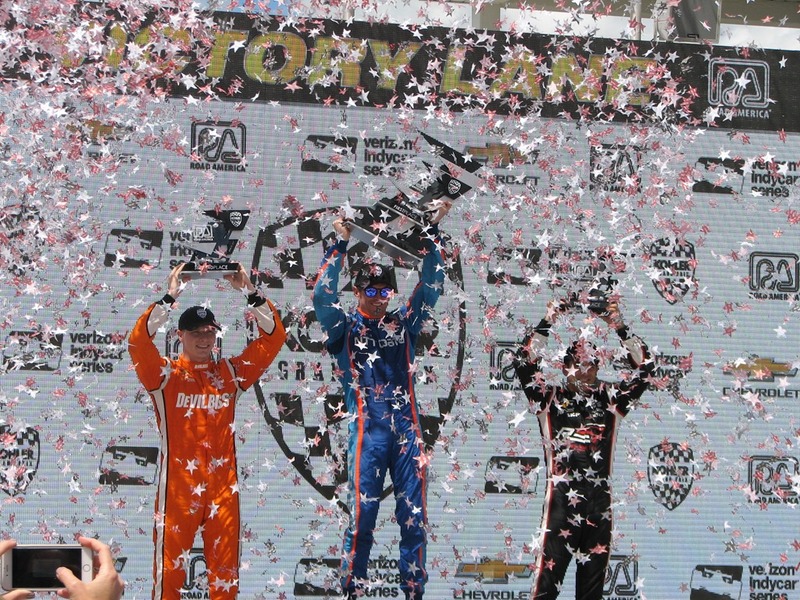 That’s how I know that this race came down to a battle between Scott Dixon and Josef Newgarden. 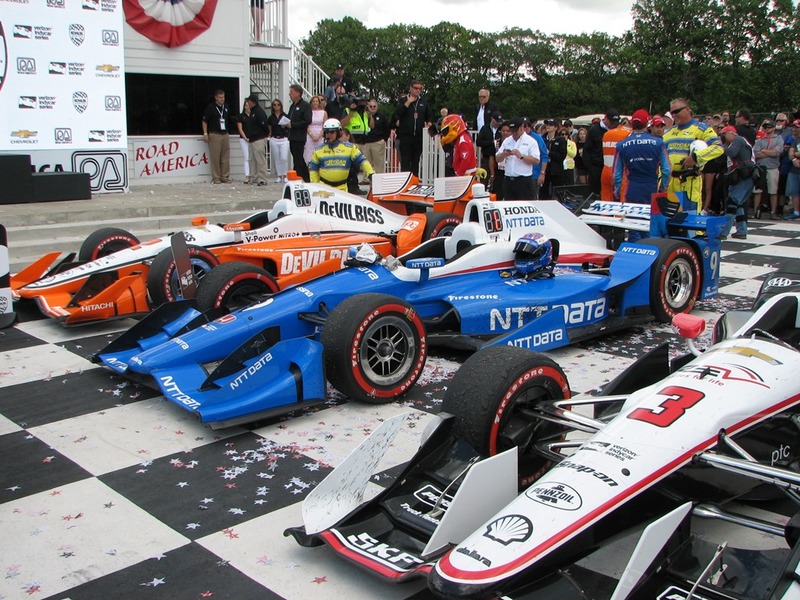 I know that Dixon passed Newgarden after the first caution that involved Takuma Sato. I also noticed from Turn One that Dixon got a jump on Simon Pagenaud at the start. While Team Penske dominated practice and qualifying, it was Scott Dixon and Chip Ganassi Racing who earned their first win of the season, and Honda getting back in Victory Lane after getting beat by Chevy at Texas. As an aside, it was the first time all season I had correctly picked the winner of the race. It was a much better race than last year, when Will Power ran away with it. There were seven different lead changes among four drivers. That’s pretty good for a fifty-five lap race. 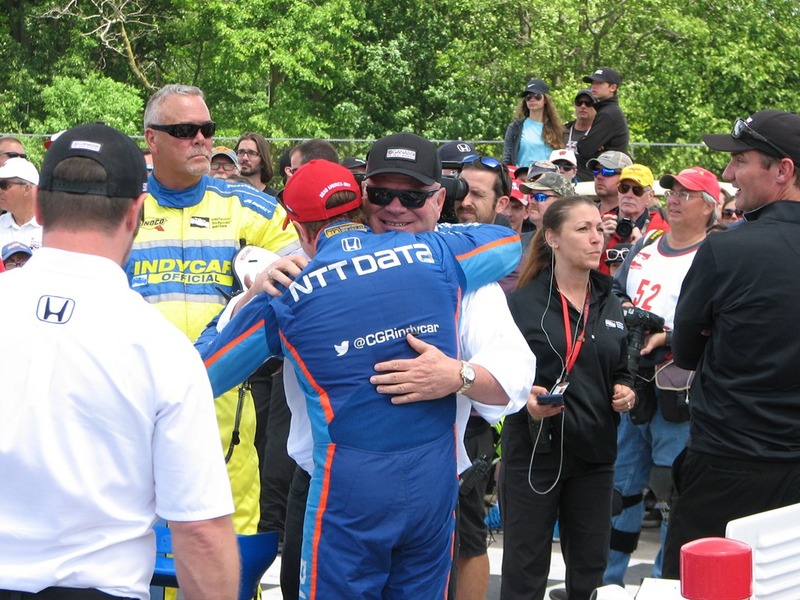 Scott Dixon earned that win by moving up from fifth and holding the lead from a hard-charging Josef Newgarden, who came in second. 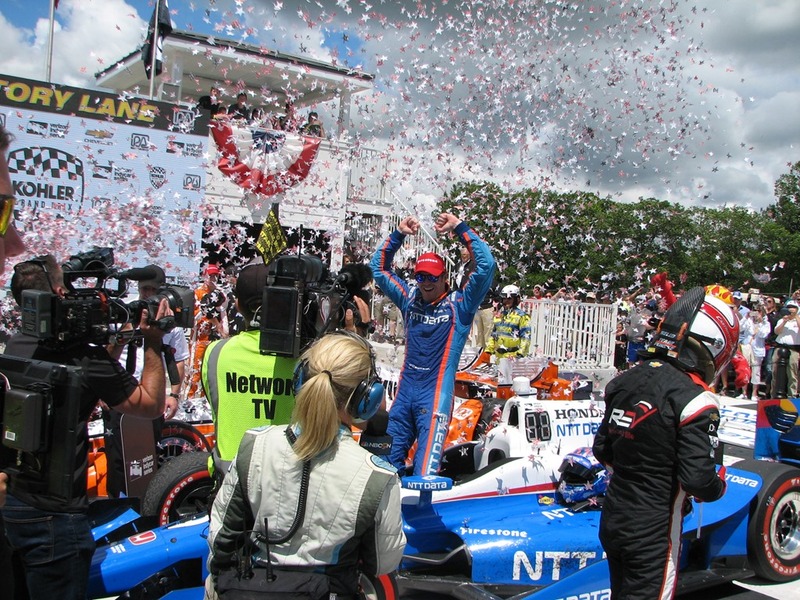 Helio Castroneves finished a distant third and was suffering from cramps in the Victory Lane celebration. That will do it for now. Thanks to everyone that followed along this weekend. I will post my usual “Random Thoughts” article on Monday with a lot more thoughts on this race and the entire weekend after I’ve had time to digest everything. Check back first thing tomorrow morning. This entry was posted on June 25, 2017 at 4:37 pm and is filed under IndyCar. You can follow any responses to this entry through the RSS 2.0 feed. You can leave a response, or trackback from your own site. Always enjoy you and Susan’s treks! Thank you for awesome reports and pictures!! Longest track on the circuit and these guys still find ways to run into each other. I enjoyed the race, but I was surprised by the amount of contact.